Six months since returning home from a refugee camp in Tamil Nadu, K. Chandrakumar is still waiting to obtain Sri Lankan citizenship for his two young daughters. He and his wife, both Sri Lankan nationals, fled the country in the early nineties during the civil war. Chandrakumar is one of hundreds who returned from India with many hopes to start a new life but now faces the obstacle of establishing either their identity or their children’s identity. Children born in India who lack Sri Lankan ID cards cannot open a bank account or apply for a job because they cannot prove Sri Lankan identity. A 24-year-old youth who wants to go to the Middle East on a labour contract has been waiting for more than four months for his NIC so that he can apply for a passport. A Sri Lankan parent should register an overseas-born child with the Sri Lankan High Commission of the country of residence in order to obtain Sri Lankan citizenship for that child. Unfortunately, a significant number of refugees in Tamil Nadu have failed to register their children with the Sri Lankan embassy in Chennai. The Organisation for Eelam Refugees Rehabilitation (OfERR) Ceylon, an NGO involved in advocacy work and developing the lives and wellbeing of refugee returnees from India, says that if the applicant is here with his or her parents and is under 21 years of age obtaining citizenship and an NIC will take three months; if he or she is 21 years or older, the process would take 1.5 years with documents cross-checked by the Sri Lankan High Commission in India and the Immigration Department in Colombo. “At least 16,000 children who were born in India are currently living in refugee camps throughout Tamil Nadu State, OfEER Director Suryakumarai Sinnathampy said. She said “complicated procedures” in government departments made it difficult for them to obtain Sri Lankan citizenship.OfERR says it has so far helped at least 600 returnees to obtain Sri Lankan citizenship. 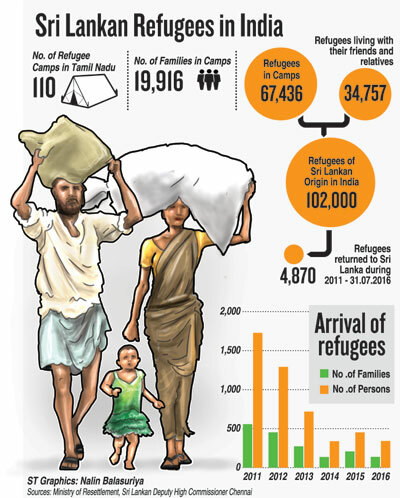 From 2011 to July this year 4,870 refugees have come back to Sri Lanka from Tamil Nadu where some 102,000 refugees of Sri Lankan origin are living in camps in Tamil Nadu or registered in camps but living outside with friends and relatives, the Resettlement Ministry said. “There is an increasing trend of refugees returning home,” the Secretary of the Ministry of Resettlement and Reconstruction, V. Sivagnanasothy, said, explaining that the normal procedure to obtain an identity card is for a person to apply through the local Divisional Secretary (DS) and Grama Niladhari, a process that can take a month for those without the particular problems of returnees. There is also the possibility for those without such problems to obtain an NIC within a week in Colombo, or within a day on payment of a fee. “If there are large numbers of applicants in any district we will take initiatives to hold a mobile NIC-issuing centre with the Department of Registration for speedy service.” Mr. Sivagnanasothy said, adding that he was not aware of a need for such a service at this time. The Commissioner-General of the Department of Registration of Persons, R.M.S. Sarath Kumara, said his department had opened two regional offices in the north and east to meet such needs among people directly or indirectly affected by three decades of war. “If the person can secure a clarification letter from the Immigration Department confirming he or she is a genuine applicant, my department will issue an NIC immediately,” he said. He said the department had run mobile identity card centres in the past to address this issue and is planning to do this again soon in areas where former refuges are being resettled. The Rehabilitation and Resettlement Ministry has sought Cabinet approval to exempt children born to Sri Lankan refugees in India from a penalty fee which they are required to pay when applying for Sri Lanka citizenship, Ministry Secretary V. Sivagnanasothy said. He said the penalty applied to those refugees whose parents had failed to register their birth at the Sri Lanka Deputy High Commission office in Tamil Nadu. The penalty ranges from Rs. 13,500 to Rs. 25,000. The secretary said the Cabinet had directed the Internal Affairs Ministry and the Department of Immigration and Emigration to study the request and come up with a recommendation, taking into account the hardship undergone by the refugees. “We are discussing this matter with the relevant authorities. These people went through much hardship since they fled the country. We believe that if the penalty charge is done away with, it would encourage Sri Lankan refugees still living in India to return to their country,” he said. Mirror, Mirror on the wall: What did she write?